4 © 2011 Health Level Seven ® International. All Rights Reserved. HL7 and Health Level Seven are registered trademarks of Health Level Seven International. Reg. U.S. TM Office. 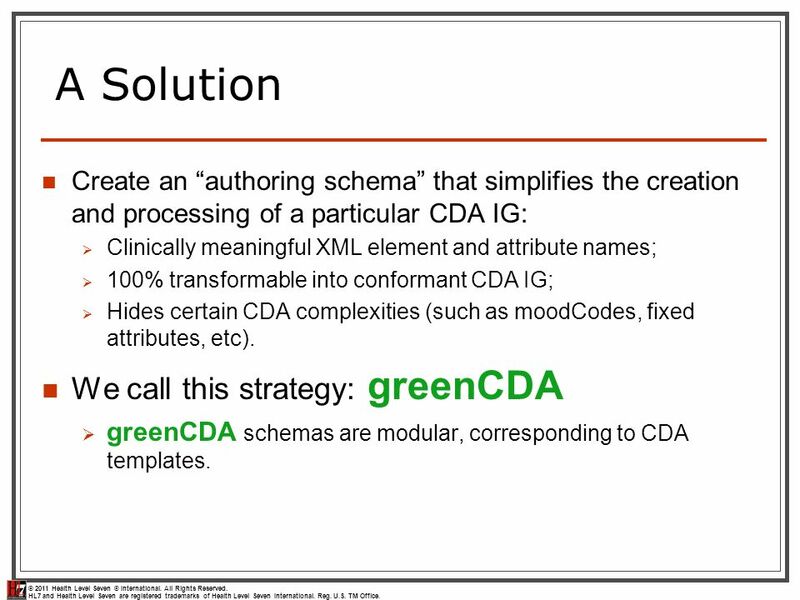 A Solution Create an authoring schema that simplifies the creation and processing of a particular CDA IG: Clinically meaningful XML element and attribute names; 100% transformable into conformant CDA IG; Hides certain CDA complexities (such as moodCodes, fixed attributes, etc). 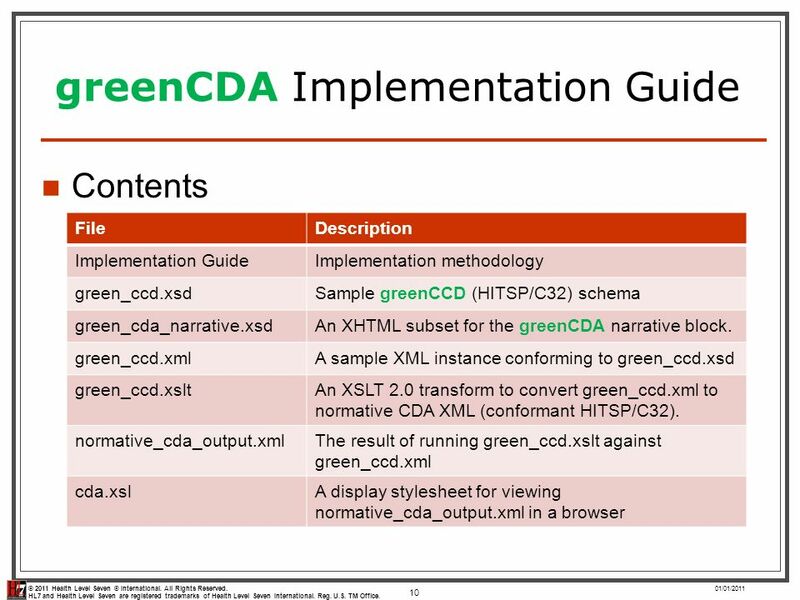 We call this strategy: greenCDA greenCDA schemas are modular, corresponding to CDA templates. 9 © 2011 Health Level Seven ® International. All Rights Reserved. HL7 and Health Level Seven are registered trademarks of Health Level Seven International. Reg. U.S. TM Office. 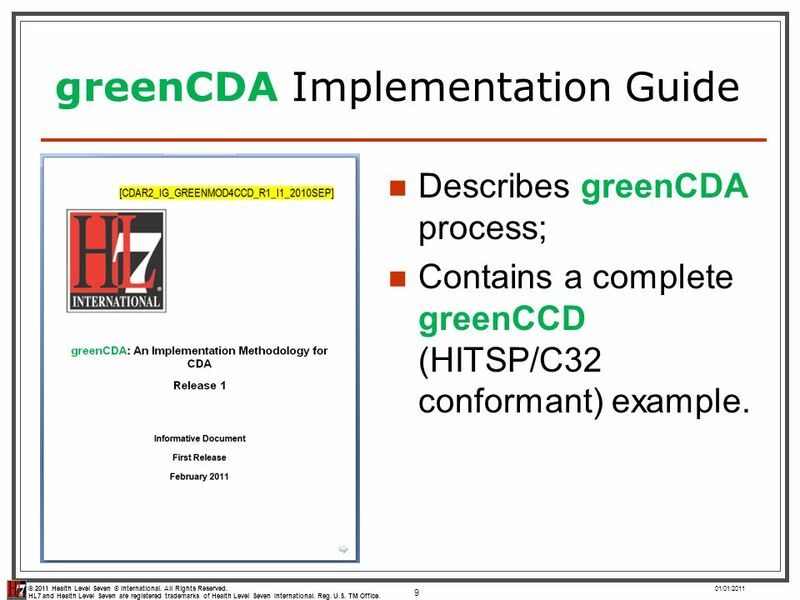 greenCDA Implementation Guide 01/01/2011 9 Describes greenCDA process; Contains a complete greenCCD (HITSP/C32 conformant) example. 11 © 2011 Health Level Seven ® International. All Rights Reserved. HL7 and Health Level Seven are registered trademarks of Health Level Seven International. Reg. U.S. TM Office. Thank you! Download ppt "© 2011 Health Level Seven ® International. All Rights Reserved. HL7 and Health Level Seven are registered trademarks of Health Level Seven International." September, 2005What IHE Delivers 1 CDA-based content integration profiles Philippe Lagouarde, Cegedim Co-chair Vendor, IHE-France. © 2013 Calvin Beebe and Health Level Seven ® International. All Rights Reserved. HL7 and Health Level Seven are registered trademarks of Health Level Seven. 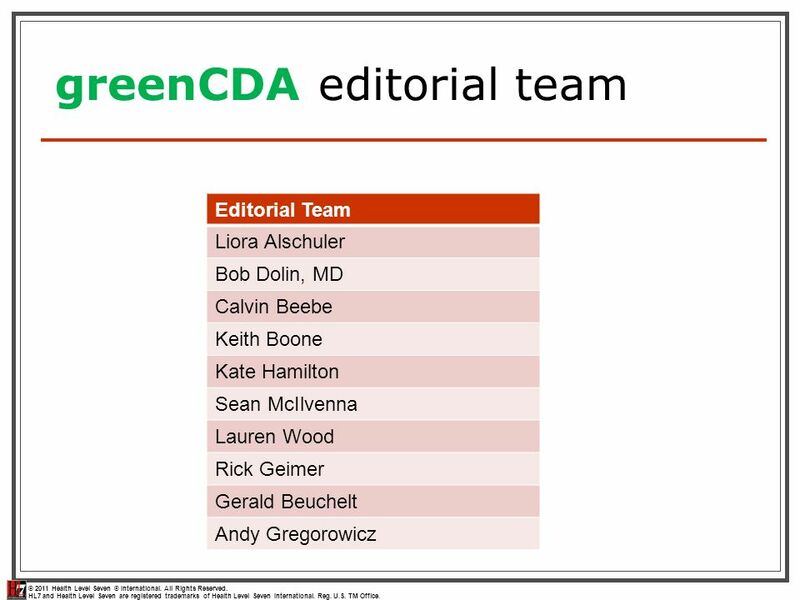 A CDA Template for Continuity of Care Liora Alschuler, Roberto Ruggeri HIMSS 2005 Acapulco partners: Charlie McCay, Ted Blizzard. Why and where CDA François Macary, Christel Daniel. 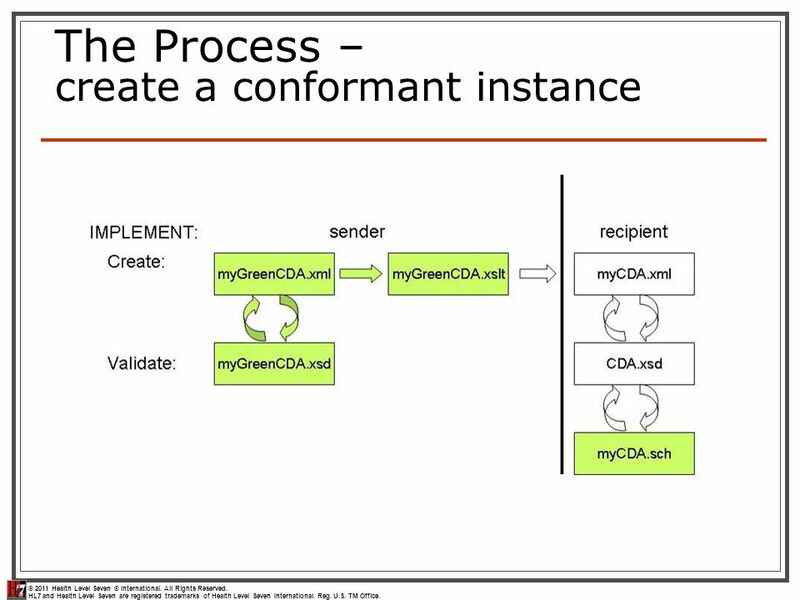 HL7 Templates A means to Manage Complexity. 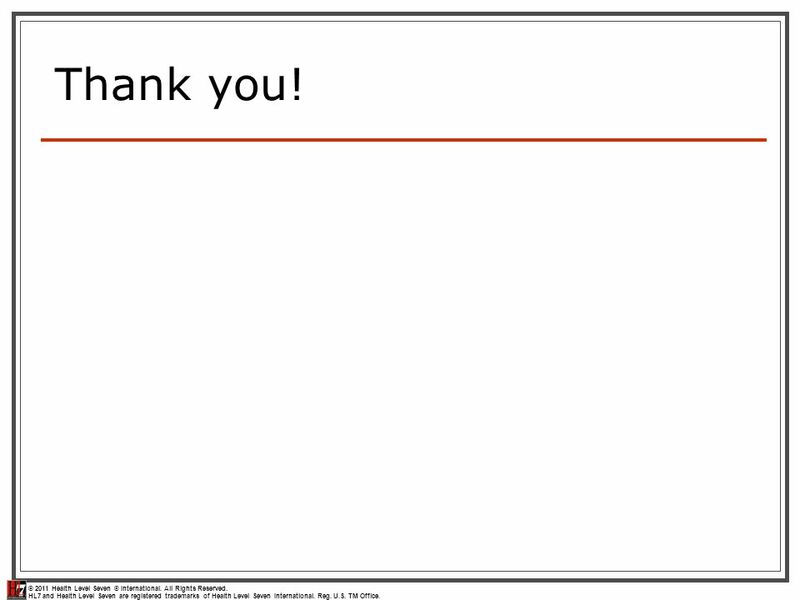 Objectives What is an HL7 Template? 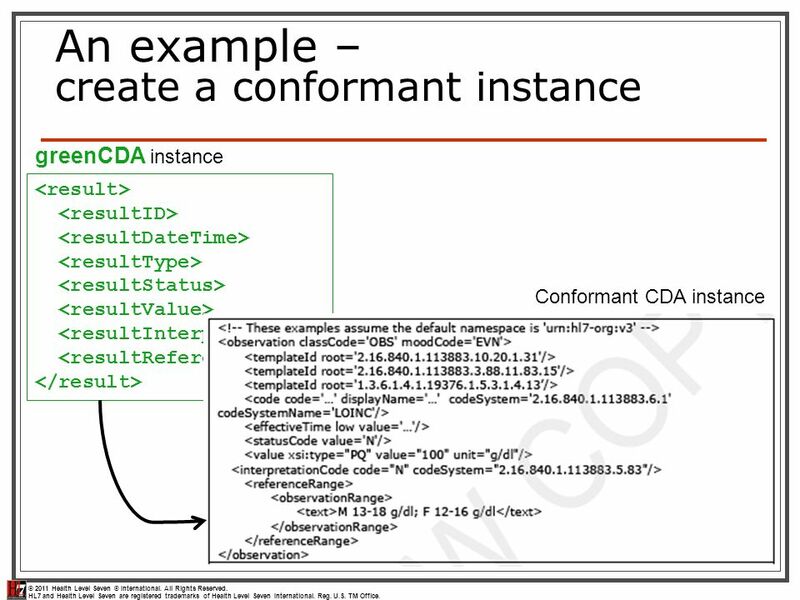 What types of constraints can HL7 Templates define? 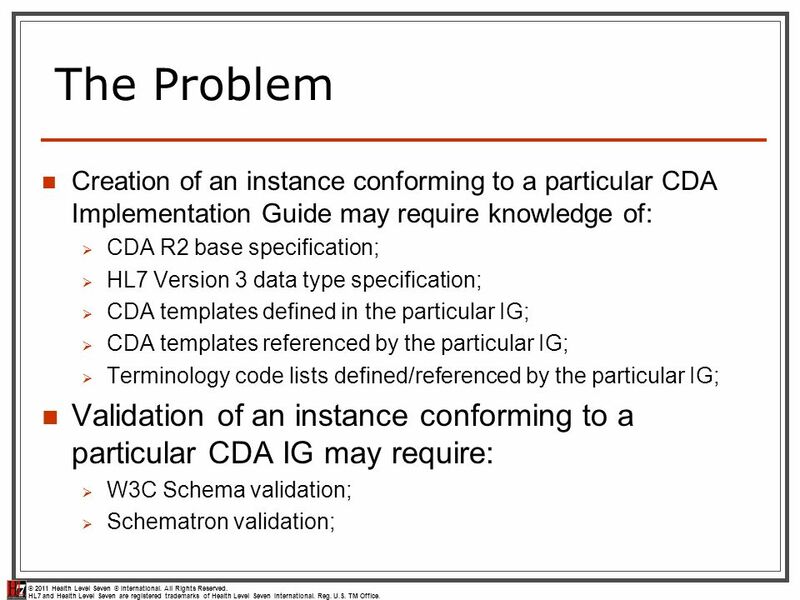 What types of HL7. WGM-May © Health Level Seven ®, Inc. All Rights Reserved. 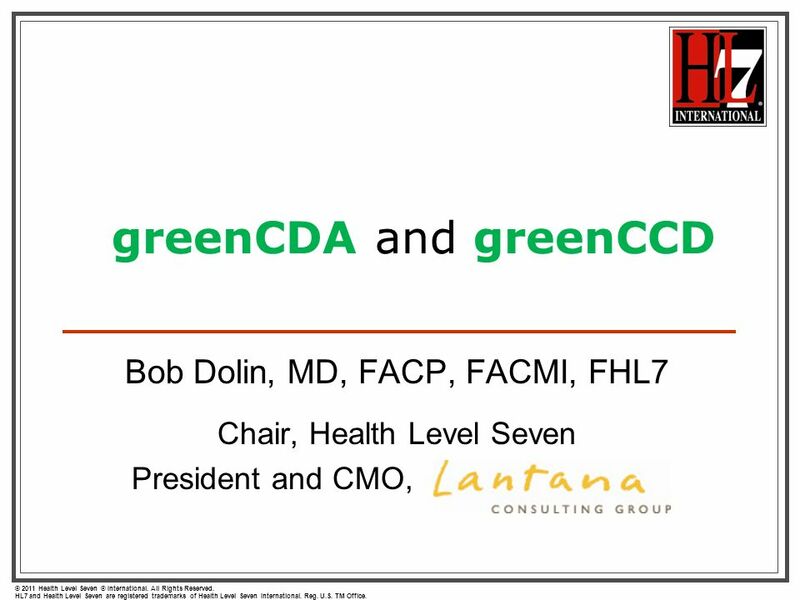 HL7 and Health Level Seven are registered trademarks of Health Level Seven, Inc.
CDA for HAI Reporting January 2007 Update. 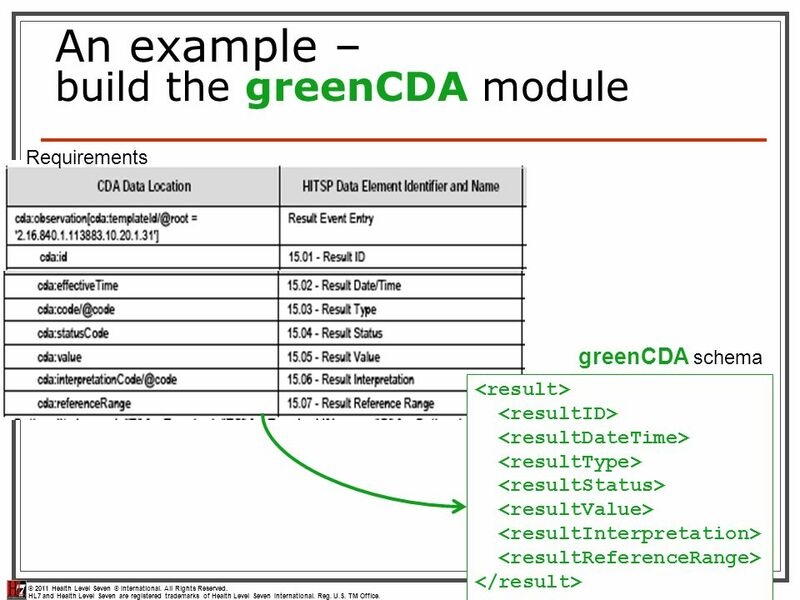 Project Outline Deliverables –Sample instances BSI, SSI, Denominator for Procedure, Denominiator for ICU –Stylesheets. 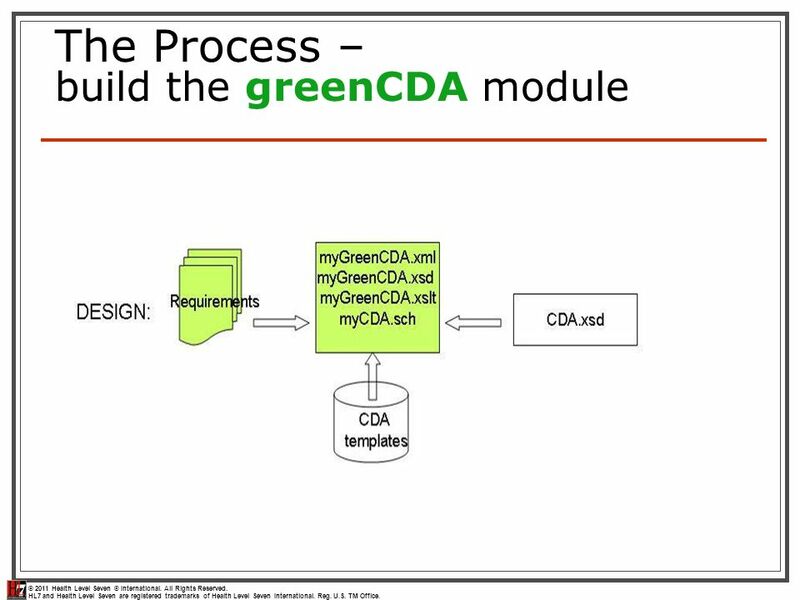 Electronic Submission of Medical Documentation (esMD) Clinical Document Architecture R2 and C-CDA Comparison April 24, 2013.